Sakura Line 311 will plant Cherry Blossom trees along a 170km line, marking the areas where the tsunami reached furthest inland. One tree will be planted every 10 meters along this line. Anywhere beyond the line will be considered a safe place for evacuation. The line will also serve as a memorial so that future generation will not forget what happened here. On March 11, 2011 a 9.0 magnitude earthquake occurred off the coast of Japan and caused a tsunami to hit the Tohoku area one hour later. The tsunami literally stopped the clock in Rikuzentakata, causing great devastation. The Sanriku Coast, the name for the north eastern area of Honshu Island, has a long history of tsunami attacks. It was only after this most recent disaster that records resurfaced of a previous tsunami of equal strength occurring long ago. However, the lessons learned from that tsunami were forgotten and remembered only after it was too late. If we had known about the possibility of a disaster of such magnitude occurring, better protective measures could have been carried out and lives could have been saved. We deeply regret that we allowed this to happen. Those who feel this same sense of regret have come together to form Sakura Line 311 and tell this story to future generations, ensuring that the lessons we have learned are not forgotten and the same mistakes are not repeated. We do not want future generations to carry the weight of this regret we share. Rubble and debris left over from the disaster is constantly being organized and removed. While this is good for Rikuzentakata to advance the revitalization plans, it also means that we have a limited time before the tsunami line fades away and is lost forever. We must work as quickly as possible to plant the Sakura. But, there is a limit to what we can do alone. We need YOUR assistance as well. Please lend us your aid in any way possible! In Japan, we call Cherry Blossoms “Sakura”. The purpose of the Sakura Line 311 project is to plant Sakura trees along the same line where the water had advanced furthest during the disaster of March 11, 2011. Many people did not anticipate the severity of the Tsunami. As a result, those who thought they were in a safe place, found out too late that they were not far enough away from danger. The Sakura Line project aims to plant trees over a 170km stretch of land, marking the least distance one must travel in order to reach safety during future emergencies. 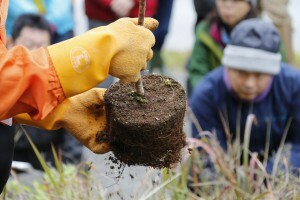 Twice a year in Spring and Fall, the Specific Nonprofit Corporation, Sakura Line 311, holds planting events in Rikuzentakata City, where volunteers come together to plant the Sakura trees. 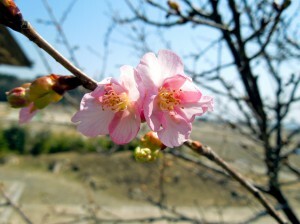 ?The first ceremony was held in fall 2011 and since then, Sakura Line 311 has planted 1,020 trees. Many volunteers participate in these planting ceremonies. People come from all over Japan to help and give donations, from Hokkaido in the north, to Kyushu in the south. On November 6th, 2011, Sakura Line 311 held its first planting ceremony. The mayor of the town of Matsuda, Kanagawa Prefecture (near Tokyo) was in attendance for this landmark event as well as many other important figures. The second Planting Ceremony was held on March 11th 2012. Rikuzentakata’s Deputy Mayor and several other high profile figures came to participate with the volunteers. There was a moment of silence for the victims of the tsunami followed by the planting of the Sakura. In addition to the tree planting volunteers, over 100 other volunteers arrived to help in the process. In November of 2012, two planting ceremonies were held. The first was a ceremony in which volunteers from all over Japan participated in planting Sakura. The second ceremony was an event in which a group consisting of only local residents and the Sakura Line 311 directors held a more private gathering. During the Spring of 2013, Sakura Line 311 again held a volunteer event and a local planting event. The Sakura Line project aims to educate future generations on the importance of being prepared during a disaster as well as ensuring that we never forget about the tragic events of 3/11. Representatives from Sakura Line 311, including director Shoma Okamoto, have traveled to many places throughout Japan from Hokkaido to Shikoku, spreading the word about Sakura Line 311. The representatives express their passion and ideas for the work they do in an effort to get more people involved in the project, update them on the current situation of Rikuzentakata City, and most importantly to ensure that the memory of this tragedy does not fade over time. The Sakura Line project is a way to get people from the community involved in the city’s revitalization. We will suggest that the area around the trees remain open for the public to use for parks and recreation. 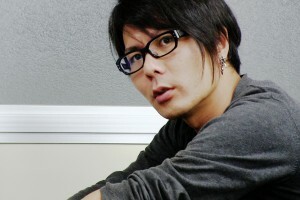 Born in 1983 in Rikuzentakata, Shoma Okamoto started his career working in the field of interior design and planning. After the disaster hit, Okamoto returned home and organized Save Takata, an organization dedicated to the revitalization of Rikuzentakata. Shortly after, he joined together with Hashizume and Sato in the creation of Sakura Line 311. Our task is not an easy one and the costs of our efforts are ever demanding. This is why we need your help. Money is not the only form of assistance we accept. If you can help in anyway, please contact us and lend us your aid so that we can carry out our project to the end. Permission to plant on private property. We need volunteers to help plant trees. 1. Permission to plant on private property. If your property resides on the line, please record where it passed through and contact us to show us acceptable places to plant our trees. The line covers a great distance and passes through many properties. Please allow us to plant our trees on your property if it becomes necessary. 2. We need volunteers to help plant trees. 3. Cherry Blossom tree donations. Monetary donations are always greatly appreciated. We only use your donations for buy and planting the Cherry Blossoms and to pay for managing the organization. We accept donations by direct deposit into a bank account. The following is our bank account information. Your assistance is necessary for the completion of the Sakura Line 311 project. We sincerely hope you will consider helping us and look forward to working together to make this project a reality.